Jamestown's Reading Fluency series, a research-based approach to increasing fluency, can help students become more fluent readers. Students work in pairs and, at comfortable levels, practice reading aloud smoothly, accurately, and expressively. One student reads aloud a narrative fiction or nonfiction passage from the non-consumable Reader. A partner uses the consumable Reader's Record, marking errors and scoring the oral reading. 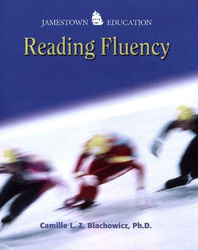 Repeated readings encourage students to improve their fluency. Students learn to read smoothly, accurately, and expressively. Repeated readings improve vocabulary and comprehension. Immediate feedback and self-assessment improve oral reading skills. Seventy-two high-level interest fiction and nonfiction narrative passages for repeated oral reading. Seven readability levels to match students' independent reading levels. Extensive teacher notes available with research background and classroom-tested ideas. The passages in this book are taken from the following sources.